Nineteen-year old Angelina Lim is certainly in the limelight at the moment. Her brother Frankie is autistic, has difficulty communicating and is afflicted with restrictive and repetitive patterns of behavior. 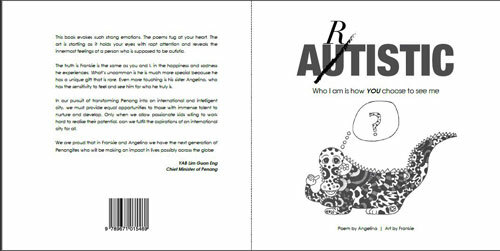 Angelina has been inspired to write a collection of poems and compiling it into a book to help people understand autism better. Her book entitled “Artistic” has since been published. 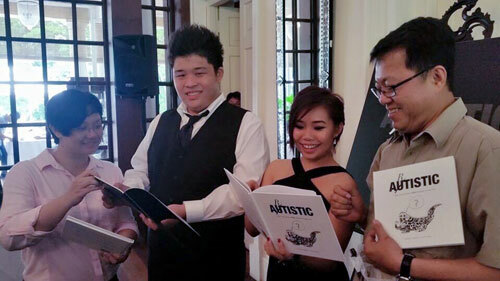 Angelina authored “Artistic” while she was studying at INTI International College Penang and is now a second year student of the American University Program. The book is dedicated to her brother and reveals her inner feelings about people who are autistic. “I have always found it disturbing that people tend to treat people with autism with cynicism. Many Malaysians have adopted the ‘Stay Away’ approach when it comes to communicating with them. I wrote “Artistic” to show that people with autism are not different from us. They merely react to stimuli in the environment in a much more sensitive way than us. That’s why we see them throwing tantrums if we were to shout at them,” she said. The 40-page book provides new insights into an autistic person’s emotions and everyday thought process. “An autistic person is usually very creative and enjoys things such as drawing,” she said in reference to Frankie. “He paints his own drawings and the inspiration for the book came largely from the messages in his drawings.”. Angelina, who is set to continue her studies in New Jersey, USA later this year took the opportunity to thank Dr. Michael Yap, Chief Executive of INTI International College Penang for helping to publicise her book. “In any given effort, you would always need someone to encourage you. Dr.Michael was the first one to come forward and encourage me to hold the first exhibition on autism in college. He even covered the expenses and helped organise the entire event. I will always be grateful to him,” she said. When asked about what her future plans are, she said, “I am aspiring to become a psychologist and is already looking forward to my studies in the States. If everything goes well, I would love to conduct research on ways to provide better education to children with special needs. I want to bring change. I want to change how people perceive other people with special needs. I want to change the world for my brother,” she concluded.